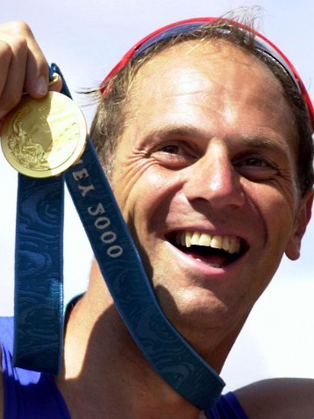 The 23rd September 2000 was guaranteed a special place in the history of the Olympic Games, when Britain's Sir Steve Redgrave won his FIFTH GOLD MEDAL in five successive Games - Los Angeles, Seoul, Barcelona, Atlanta and Sydney. Redgrave's feat is unique in the annals of Olympic endurance achievements and, in the words of IOC President Juan Antonio Samaranch, "Raises Sir Steve Redgrave to the highest rank of Olympic participants." 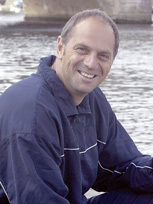 But even before the Sydney Games, Sir Steve Redgrave had already confirmed his status as Britain's most successful Olympian and the world's greatest ever oarsman. In addition to his Olympic successes, and following four unbeaten seasons from 1993 to 1996, Steve (and partner Matthew Pinsent) won his NINTH World Championship GOLD in August 1999 in St Catherines, Canada. His previous World Championship Golds were in 1986, 1987, 1991, 1993, 1994, 1995, 1997 and 1998. He had also won many other honours in the sport over the previous eleven years, including the Henley Royal Regatta Diamond Sculls several times, the Silver Goblets a record seven times while in 1986 he became a Triple Commonwealth Gold Medallist at Edinburgh, winning the Single Scull, Coxless Pairs, and Coxed Four. Together with partner Matthew Pinsent, Steve broke the WORLD RECORD in Coxless Pairs in Lucerne in 1994 and the OLYMPIC RECORD, in Atlanta in 1996. His other sporting interests include golf and winter sports, and during the 1989/90 season, he was a member of the British Bobsleigh Team. But perhaps even more impressive than Redgrave's extraordinary athletic performances themselves, is the fact that they were achieved against a background of serious illnesses. He nearly missed the Atlanta Games due to colitis, for which he still receives treatment, and in 1997 he was diagnosed as diabetic. Sir Steve was knighted in the New Year's Honours List 2000, which accompanies his MBE, he was awarded in the New Year's Honours List in 1987 and the CBE in the New Year's Honours List of 1997. The Universities of Durham, Oxford Brookes, Loughborough, Hull, Buckingham and the Open University amongst others have also awarded him Honorary Degrees. Steve was appointed Vice-President of the British Olympic Association in November 2000 and was President of British Rowing from 2001 to 2015. Steve is also an Honorary Vice-President of Diabetes UK. Since retiring Steve’s exceptional public image has made him an ideal celebrity for product endorsement and is a very popular keynote and motivational speaker. In 2001 Sir Steve set-up his charity – The Steve Redgrave Trust, aimed at raising £5 million over five years for children’s charities. In April 2006 at the London Marathon, he broke the record for the most money raised by an individual, a staggering £1.8million and in doing so broke the £5 million target he set himself. In February 2008 the charity was renamed the Steve Redgrave Fund, joining Sport Relief and became part of the Comic Relief family. Sir Steve has also published six books; his biography, “A Golden Age,” “You Can Win at Life”, “Enduring Success”, “Great Olympic Moments”, “The Complete Book of Rowing” and “Inspired”. Steve had a pivotal role in convincing the Mayor of London and the Government to come on board and support the London 2012 Olympic bid and was a presenting Team member in Singapore in 2005. On the build up to the Games he had been Legacy Ambassador helping the Government strategy of Human Legacy for 2012. He has been three times Torchbearer at three Olympic Games and was the final Olympian to carry the torch into the 2012 stadium and pass on to his nominee Cameron MacRitchie, who was part of the seven young athletes that lit the Cauldron, signifying the start of the 2012 Olympics on the 27th July 2012.